First of all, weekly reflections give students the opportunity to celebrate successes each week, whether big or small. A student may have finally finished a challenging book that they have been working on, or finally mastered their x8 multiplication facts. No matter what it is, it is important that students have the chance to acknowledge their growth and learning, and the different ways they are successful throughout the year. Focusing on a success each week shows students that their hard work and effort is paying off. It also gives students the confidence they need to take on other challenges! 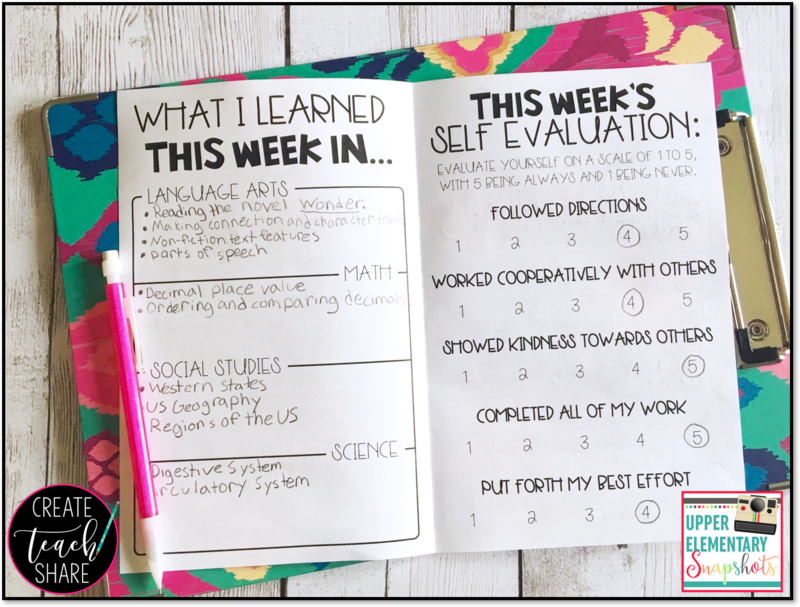 While addressing challenges is not as rewarding for students as celebrating their successes, it is still a very important part of weekly reflections. Students need to be able to identify what is challenging for them, in order to learn and grow. This is the perfect opportunity for students to communicate to themselves, their teachers, and their parents, exactly what they find to be challenging. Once these challenges are acknowledged, all involved can work together to address those challenges, and make a plan to overcome them. It is so important that students know what behaviors are expected of them at school. However, it is just as important that students are able to evaluate their own behaviors, and how those behaviors impact their learning and the learning of others. In this particular booklet, students rate their classroom behavior and work habits on scale from 1 to 5. When doing this they are able to acknowledge how well they did with each of these behaviors. This is also a great communication piece for parents, giving them a chance to discuss specific behaviors with their children, and to set expectations for the following week. 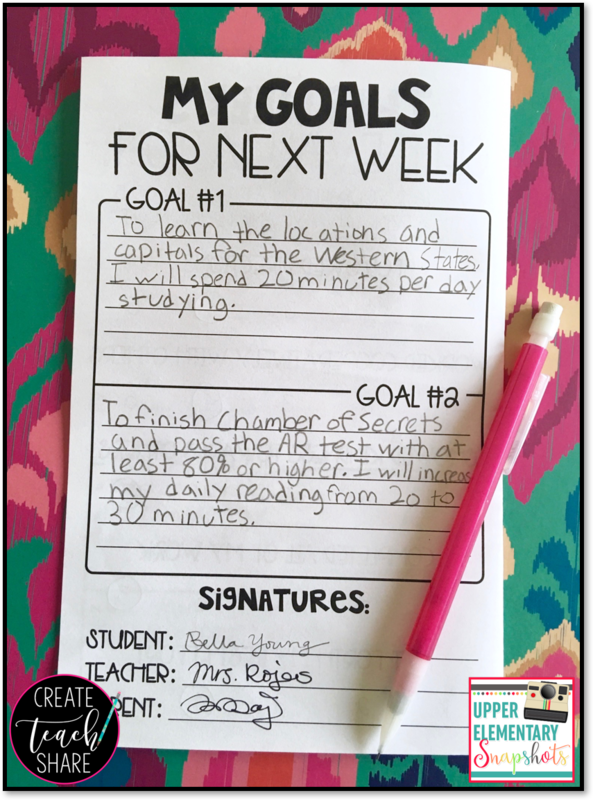 Once students are able to reflect on their successes, challenges, work habits, and behavior, this leads to the perfect opportunity for them to set short term goals for the next week. They might decide to focus on what was challenging for them that week, or focus on behaviors where they might need some improvement. Students might also choose to focus on something specific for that week, like a test or project that might be due. One of the most important parts of student goal setting, is that they also state how they plan to achieve their goals for the next week. As a mom and a teacher, I know all too well that students are not always the best about communicating what happened at school each day. I have heard far too many "goods" and "fines" when asking my own kiddos about their school days. 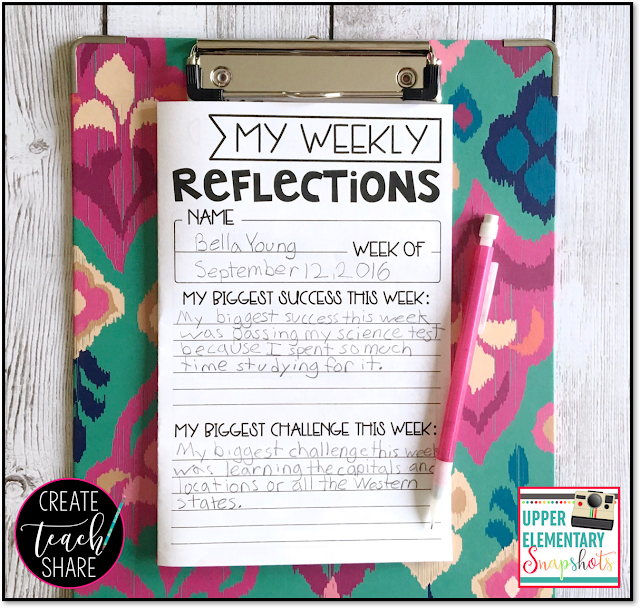 Weekly reflections are the perfect way for students to share what they are learning each week. They open up conversations about what's going on in the classroom, and students can then share their successes, challenges, and goals for the following week. I truly think the most important benefit to weekly reflections are the conversations that students get to have with their parents and teachers. Weekly reflections puts everyone on the same page, and parents and teachers are able to reflect along with their students. 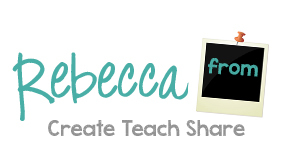 If you are not already using a reflection piece with your students, I urge you to give it a try. 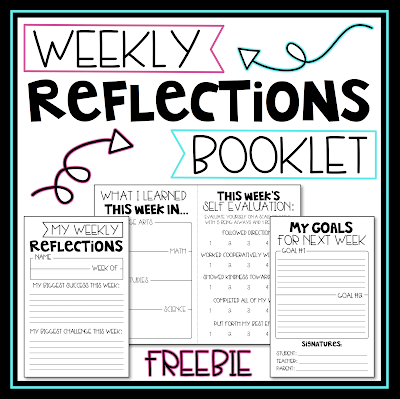 Click the pic below to download a Weekly Reflection Booklet to use in your own classroom. I guarantee that you will see these same benefit with your own students! !